Club Penguin Cheats by Mimo777 Club Penguin Cheats by Mimo777: Club Penguin Pin Cheat - CARABINER PIN! 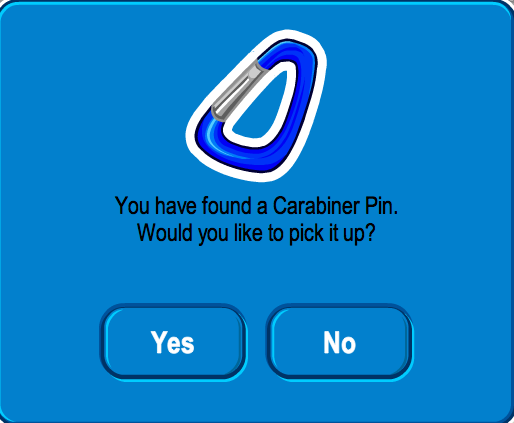 Here is how to find the new Club Penguin CARABINER PIN cheat. Thanks for your pin tracker, Mimo! Wait theres loads more stamps! Idk how the carabiner pin fits in with the mountain things. 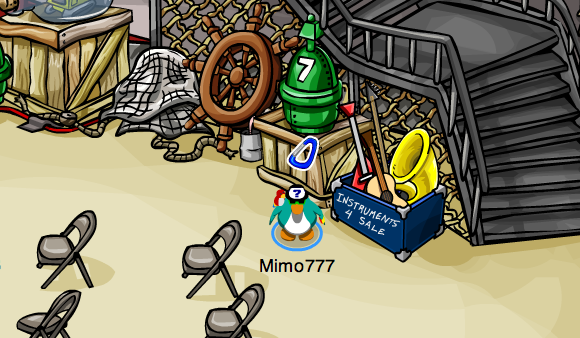 I guess cp might be planning something that we are not prepaired for. Maybe, maybe not. I chose a REALLY good month to activate my last membership card! P.S I'm pretty sure club penguin crashed just recently, because everyone is saying they lost connection. Maybe its because club penguin fixed the stamp glitch in that moment in time! after all, they work now! I'm pretty sure that you use carabiners to climb mountains. According to my research, you wear a climbing harness and attach the carabiner on. Which makes it so that you don't fall (or at least that if you do, you won't fall ALL THE WAY down the mountain). if you want info on how to use carabiners (which will also give you proof that I am not lying), look it up on google and click on the 'eHow' link (second link). First off Bolt dont put CPG mod unless your modding a comment. Secondly carabiners are pretty much made for climbing or repelling. hi mimo, you know when you are looking at a comment on your blog and it says for example "August 12 2010 11:12 AM" is that Penguin Standard Time? eh...mimo how do u insert pics i tryed on my new blog but it doesnt work plz help me! It makes Club Penguin easier, doesn't it? Mimo's already posted about that. Thanks anyway! Mimo, when are mod changes? I really want to see who moved up. I'll go check it out. Sounds cool! Hey mimo i just figured out if one of ur friends are doing a mission it will say the name of the mission then _find pretty cool eh??? Well, carabiners are used for rock climbing, canoeing and kayaking. So it fits in pretty good. And also, please don't put (CPG MOD) next to your name if you aren't modding. Thanks! I agree! They were pretty cool looking! But I think this pin is pretty sweet, too! What about you? There's also a puzzle one where you have to complete a puzzle in a party! I wonder how many stamps there are now! There are? I only know about 2 new ones! I love how they add new stamps! Maybe! Every time CP updates, ppl lose connection! So maybe! I wasn't online when it happened, so I don't know anything about it. Umm.... It's not really like Tootsville's! Shadow Guy is a superhero bent on defeating the giant squidzoid. LOL. And I think Shadow Guy is older than the Tootsville shadows! It was actually longer than I expected! And I still wasn't finished finding the secret room until a certain SCAMPER52596 told me! xD But no joke. I'm watching you Scamper. Yea, they were pretty cool. I liked it when they were smaller too. But the last couple pins were a bit smaller so maybe they're going back to making them smaller. And im happy for the Happy Room stamp! Im so happy I think I might eat a fish with ketchup and mustard! Wait, that soulds gross. Aww, now I thought something gross and im down again. We need two of those stamps! Well actually, the Shadow Guy and Gamma Girl play has been around for years and is older then Tootsvilles Shadows. It's probably as old as Tootsville. lol. Somewhere around there anyway. I don't really know. I think it is. Mainly cause im looking at the first and second comments time matched to when Mimo posted this during the day which was around one PM MY time soo yea. I think it is. Me too. It will probably be soon. Im guessing later this month or so. But only Mimo knows this. Yea, same with me really. I read Mimo's site since 2008 and never posted a comment till early 2010. Good luck becoming a Mod! You'll have fun being a Mod. I know I have fun. See you around. Coolio! It reminds me of that other lock pin, you know? Hey everyone To get the puzzle stamp you just have to get through the icicles and then it just says that you have got the pin!!!! Thank you Mimo777 so much!You just gave me my 100th pin!I've been collecting pins since the candy cane pin came out on December 23 2006! Thats great me to thats my lucky 100th stamp! Same with me i started some where around 2010! LOL! XD I found a twinky on da floor i think scamper left it! Right now no penguin knows. (ugh my dramatics momments XD)But prety good guess cause that would be around my secound or thrid choice and i encourge u to keep spreading that so if its true then everyone would give u credit!